A-Line Chiffon Wedding Gown - Custom Made in New Delhi, India from Purnima Exports - Garment Manufacturing Co. 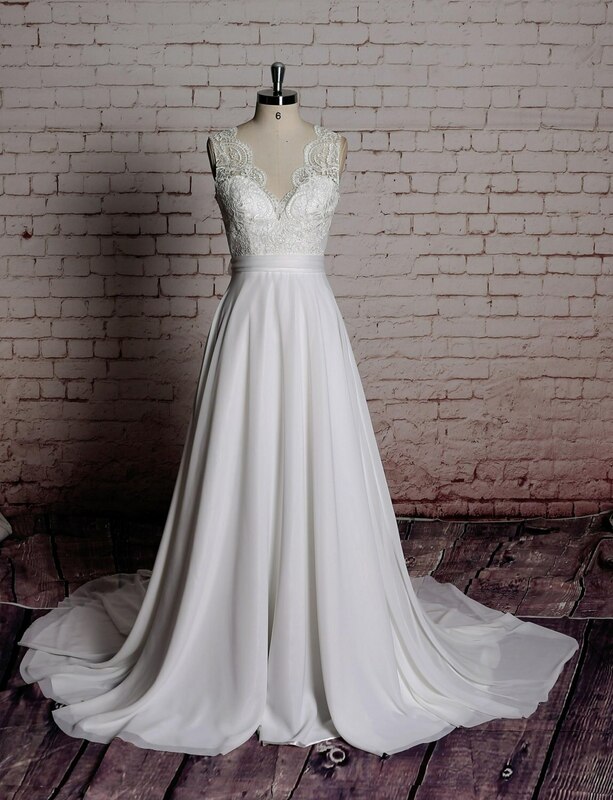 Simple A-line Wedding Gown Chiffon Bridal Gown With V-Back Cut Wedding Dress with Organza Sash 1.As always, Custom Made(your own size, your preferred color). 2.I carefully select high-quality beads, pearls, fabrics and threads to create every dress. 3.For this style, I need: Color: ________(Ivory as pictures) Height: ________ Bust: ________ Waist: ________ Hip: ________ Hollow to Floor: ________ 4. My promise: All my dresses are sold at such low prices because I am New on etsy and hungrily want to attract new customers and earn best reputation. I promise to give you a perfect dress. Silhouette: A-line Neckline: V-neck Hemline / Train: Floor-length Sleeve Length: Sleeveless Back Details: Zipper up Fully Lined: Yes Built-In Bra: Yes Fabric: Lace/chiffon Tailoring Time: 6-8 weeks Q: How far in advance should I order my dress? A: Your dress will be made immediately FROM SCRATCH after your payment, so it may take longer to arrive than those IN STOCK. I advise ordering a minimum of 6 weeks(tailoring time+shipping time) before you need to wear the dress. But if you are in a hurry, please contact me first. I will work overtime with rush service. Q: Can I order this dress in a different style/fabric/length? A: Absolutely, all my dresses are made-to-order according to the information you provided and I will make the dress unique as you asked. Q: Will my dress exactly match the color I see in your shop? A: I can not guarantee that the color of your dress will be exactly same with the picture because of inevitable chromatic aberration between photos and reality. But do believe I carefully select first-class fabrics for you. Q: Will I be required to pay import duty by my country's Customs? A: Based on my past experience, most of the countries do not charge import duty on low volume personal imports. But you should pay it if have to.